At around 5 a.m. Shackleton put another trick out of his leadership bag. With the full moon for guidance across the Murray Icefields his men came to near exhaustion when they were approaching yet another ridge. They were heading for a gap ‘like a missing tooth’. They were barely able to move one foot in front of the other, so Shackleton suggested a quick snooze. Despite the cold the other two immediately fell asleep but Shackleton stayed awake, afraid if he would fall asleep they would all freeze to dead. After five minutes he shook them awake and told them the slept 30 minutes. Energized by the psychology of rest, they run up the slope, straddling a little pass that drops into Fortuna Bay on the other side. We could only pull the sledges behind us a little ways before it became too steep and start pulling us back down. We yank an iceaxe behind the sled to prevent it from sliding backwards and booted up to the notch. From there we hauled the sleds up the notch and belayed them down the other side. We curse the sleds, how much easier it would be if we just had a little backpack, and do you really need all this stuff in your sled anyway? The powerful wind forces itself through the little notch and it is hard to just stand up straight. This ridge is now called Breakwind Ridge. In front is the Bay of Fortuna and if you listen careful you hear the furseals calling – and further down there are icebergs floating in Stromness Bay. Shackleton must have been elated – he recognized the zigzag stripes in the rock that mark Stromness Bay. But the moment in the odyssey came when they stopped later for breakfast ‘hoosh’ exactly at 7 a.m., timed on their chronometer they slepped all the way from when the Endurance had sank. They heard the whistle of the whaling station in Stromness ordering the people to start to work. ‘Never’ wrote Shackleton ‘had any of us heard sweeter music. It was the first sound created by outside human agency that had come to our ears since we left Stromness Bay in December 1914. While Shackleton must have lived off adrenaline now with the knowledge help is around the corner, for us the toughest part of the adventure is still to come. We ski with our sleds on the other side of the hill and make our way to the steep gully that separates us from the breakwind pass and the beach at Fortuna. We take a quick break and put on our crampons to continue down the steep glacier in the gully. Axel was most worried about this part of the trip because with bleak snow conditions this could easily be blank ice and non-negotiable and then we would be stuck with no real escape route. At the end of the snow gully we scouted the way down through the ravine. There was no ice to be seen instead we run into raging whitewater cascading over rocks and sometimes disappearing underneath a snowfield. With all our stuff still above, we decided we could only take the most necessary things down, like some food, a tent, sleeping bag and skis and sleds will have to stay up there. We fill our backpacks with what we could and descended on the exposed rocks next to the river until we found a path where we could walk down to a bench overlooking Fortuna Beach. Again another long day but luckily the wind quit and with the smelly grass and noisy wildlife below set in salty air, it felt we entered a first summer day from the frozen icy interior of South Georgia. The next morning help came from the ship and assisted us with carrying the remaining gear back down the gully. 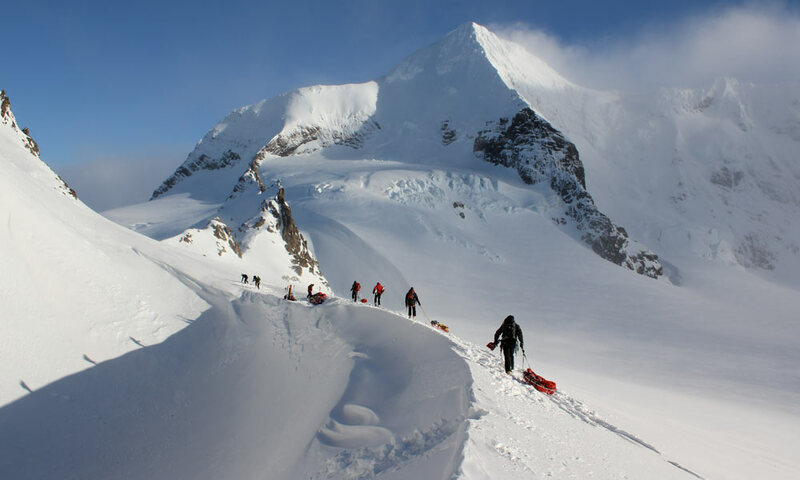 Even though we had our own unknowns and hardship due to difficult conditions on the route, we all felt in awe in what Shackelton was able to achieve in just 36 hours with only the haziest knowledge of what they would find and no proper equipment – they did it on pure will and responsibility to get the entire team back safe.